A cozy cage for your pet mouse needs cozy bedding. Algernon or Serafina can find a mouse-sized bundle of happiness in their preferred bedding, which provides a comfortable spot to nest and sleep, soaks up waste and offers a little extra insulation and warmth. Mice do well in bedding material made of aspen shavings or shreds. Cover the floor of your mouse's cage with these soft and absorbent shavings to a depth of about an inch. 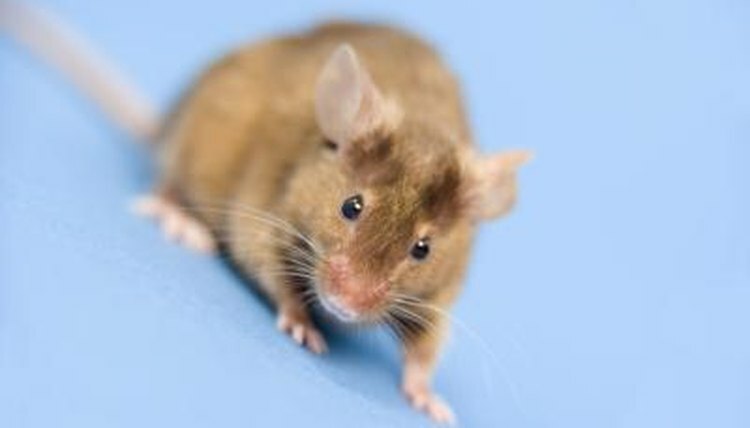 Aspen shavings are free of phenols, which can bring respiratory harm to your little mouse-ster. Mice also thrive in low-dust pelleted bedding. Look for a pelleted bedding material manufactured out of recycled paper. You may like the smell of pine and cedar shavings, but Herbert and Harriet do not. Although aspen shavings are indeed appropriate and safe, as are chips of maple, beech, birch and poplar, these ones are not. Your poor mouse needs to avoid breathing in gases emitted from oils in the wood. Corn cob litter won’t work either, as it can mold and choke Mickey if he starts to eat it. Mice also can be perfectly content amid economically friendly paper bedding materials, whether paper towels, toilet paper, tissues or even paper that has been cut up into small pieces. Just make sure none of these paper products give off scent. And you can add alfalfa hay to the bedding -- they may nibble at it, helping give them a shiny coat, or build a nest with the hay. Mice also prefer bedding that is clean, comfortable and regularly changed. Refresh your pets litter at least once a week. By doing this, you keep your mouse's environment relaxing and clean, minimizing odor. You can also spot-clean the cage daily, scooping out wet areas and adding additional bedding. Speak to your veterinarian to narrow down preferred bedding options. She may be able to offer you recommendations for bedding materials.